At its 2018 Annual Conference, Fix Auto USA set a new tone for its future with a sold-out crowd of attendees last month in La Quinta, CA. Fix Auto USA Franchise Partners and their key employees were joined by executives representing every facet of the industry. The Conference celebrated the synergy of the extended Fix Auto USA Family, market- leading performance, and a higher purpose. 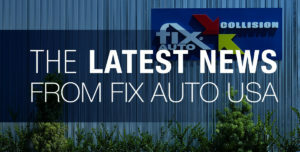 “Bringing our entire enterprise together is not only critical to our success, but also to our culture,” stated Fix Auto USA President and CEO Paul Gange. “Allowing our Members to visualize their place on the Fix Auto USA family tree and engage with each other and key industry players reinforces the value that a cohesive network brings to independently owned and operated business. To see that each Franchise Location is aligned and chartered on the same course is very powerful for our Members,” added Gange. Giving back to our local communities is one of the core values of Fix Auto USA’s network. Continuing a Conference tradition, this year the Fix Auto USA Family raised over $100,000 for a very worthy cause, The Lucky Duck Foundation; which provides services and housing for homeless residents in San Diego. The Lucky Duck Foundation’s model is also being evaluated for implementation in other major U.S. metropolitan areas. Notable donations were made from Fix Auto USA, PPG, Mitchell International, Enterprise Rent-A-Car, and many others in attendance. Recognizing and celebrating success is a highly anticipated component of the Conference’s agenda. Fix Auto USA’s Conference concluded with the Franchisee-of-the-Year presentation. Each year, Fix Auto USA awards and honors a Franchisee that stands above the rest and exhibits qualities that help drive the brand forward, improves the brand’s image, and is Fix Auto USA’s highest honor and represents the absolute best-of-the-best. This year’s Franchisee-of-the-Year award was bestowed upon Steve Springer and Mary Oliver-Springer; who together operate Fix Auto Gilroy, Fix Auto San Jose, and Fix Auto Sunnyvale in Northern California. The Best Estimator award was presented to Tony Espinosa from Fix Auto Palo Alto.